Vitamin A and its byproducts are very important in the body. 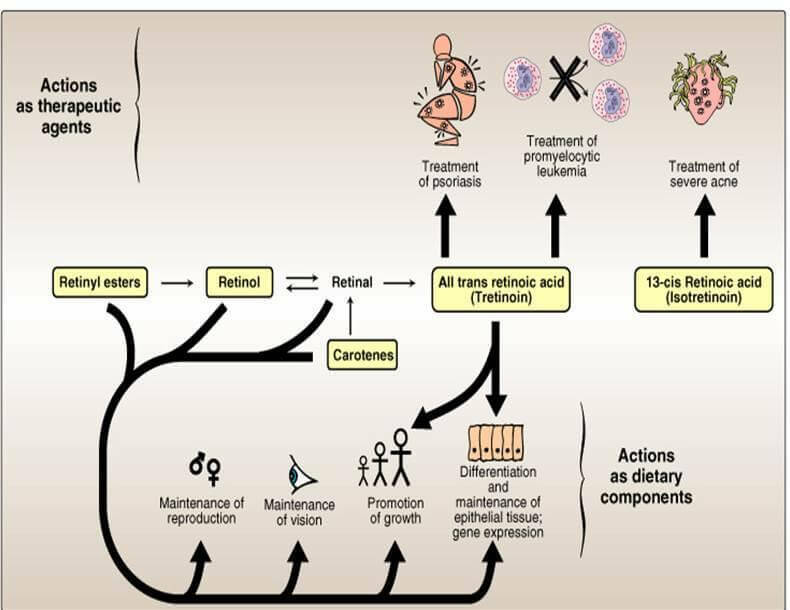 It could be more of utilization problem or another issue, but retinoic acid and its interactions is a major link in inflammation/disease that holds promise for people. Vitamin A and its byproducts are very important in the body. Whether supplementation would help these people I can’t know. It could be more of utilization problem or another issue, but retinoic acid and its interactions is a major link in inflammation/disease that holds promise for people. Vitamin A is crucial for your brain, immune system, skin, eyes, teeth, bones and for the formation of hormones. This is one reason why people with chronic inflammation without fail have skin problems. Vitamin A protects our eyes and skin from UV damage, so it will allow you to get UV and limit skin cancer risk [R]. Vitamin A/Retinol is crucial in activating Retinoid X Receptors (RXR), which is required for PPAR activation (DHA can also activate RXR) [R]. Vitamin A is also crucial in activating Retinoic Acid Receptors (RAR). Both RAR and RXR are crucial DNA binding proteins (transcription factors), which are needed for genetic expression. 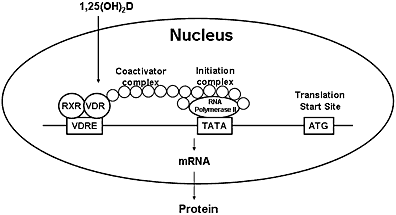 RXR is needed to activate the vitamin D receptor (VDR) and the Thyroid Hormone Receptor (THR). In simple English, this means if you’re deficient in vitamin A you can take all the vitamin D you want and it won’t make that much of a difference because you need adequate vitamin A to make these work properly. Vitamin D absolutely needs RXR in order to get the benefits from it and Thyroid hormones need RXR to work effectively. 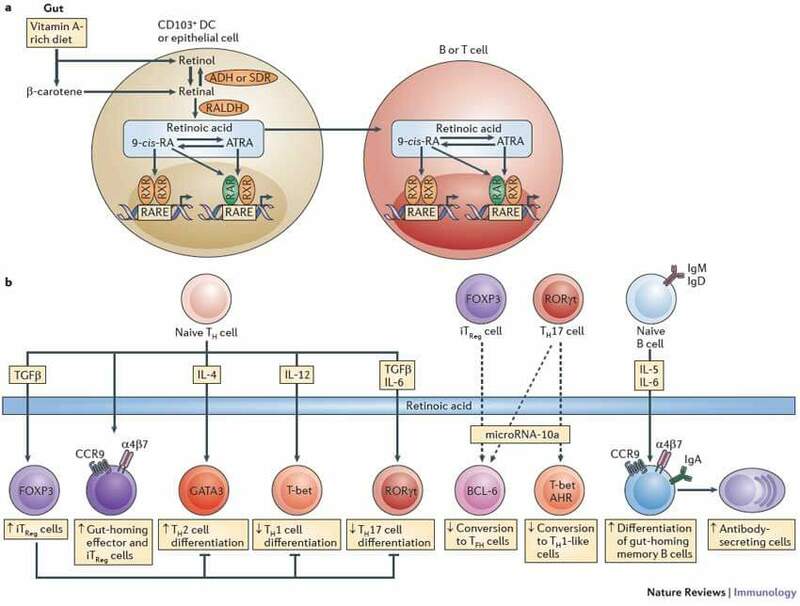 See below how you need Vitamin D Receptor (VDR) to combine with Retinoid X Receptor (RXR) to result in gene expression. Therefore, you need adequate retinoic acid (a breakdown product of retinol) and vitamin D3 for these to function. If you are popping your vitamin D pills (or thyroid hormones) and it’s not working for you then try to add some real vitamin A/Retinol (upper level=10,000 IU daily) and see how you feel. Vitamin D might not work for you anyway (it’s better for Th1 dominant), but vitamin A will make it more likely to work for you. Vitamin A increases your Th2 immune system and decreases Th1 and Th17. It’s especially important for the gut immune system. Vitamin A has other important immune functions and may help you even if you’re Th2 dominant, but it will be less likely to help you than a Th1 dominant person such as myself. However, if you are Th1 dominant and have low PPARs, you want to make sure your diet includes real vitamin A.
Vitamin A/RXR is crucial for inducing oral tolerance to proteins and it increases Tregs. Vitamin A-deficient animals have lower adrenal hormone production [R]. Another study shows that Vitamin A deficient rats had excess cortisol and expressed a hyper cortisol response. When they were given vitamin A their cortisol normalized [R]. I’ve mentioned in my adrenal fatigue post that abnormal production of cortisol doesn’t indicate your adrenal glands are broken. It could be cortisol is abnormal because of low or dysregulated vitamin A.
Vitamin A might benefit obesity by increasing UCP1 in mice, which increases heat loss/fat burning. But studies in humans haven’t had the same results [R]. Vitamin A/Retinol plays a central role in increasing neuroplasticity and neurogenesis. It’s critical to our hippocampus and hypothalamus, which controls memory and wakefulness, respectively [R]. Indeed, vitamin A is important for long-term potentiation (LTP), which is important to form memories [R]. Vitamin A deficiency causes a circadian dysrhythmia, which in turn results in cognitive dysfunction [R]. When I disrupt my circadian rhythm, I notice increased inflammation, oxidative stress and my cognitive function go down. This happens in people whose circadian rhythm isn’t functioning well [R]. Vitamin A is critical to have a normal circadian rhythm and Animals fed a Vitamin A (retinol) deficient diet have a circadian rhythm that doesn’t work in synchrony [R]. When Vitamin A causes a circadian dysrhythmia it likely results in cognitive dysfunction [R]. Specifically, the deficient diet caused an altered rhythm of antioxidant production by our body (Glutathione, catalase, GPx) and BDNF. This results in suboptimal cognitive performance [R, R, R]. Vitamin A-deficient animals also had reduced periods of wakefulness and energy expenditure (locomotor activity) [R]. In addition to being important for daily rhythms, retinoic acid is also important for seasonal rhythms [R]. Vitamin A is essential for the beta-cell function in the pancreas, which is responsible for insulin release. Its deficiency leads to excess glucose in the blood [R, R]. Vitamin A does compete with vitamin D and K2 and studies show higher vitamin A is associated with lower bone density [R]. Scientists believe the relationship is causal. My own experiments with vitamin A support this, as I find that when I take vitamin A supplements, I have a higher need for K2 supplements (evidenced by gums feeling weak and sensitive and bones feeling less sturdy). I used to think of nutrients in terms of the RDA. I don’t anymore. I think of it in terms of an individual’s biology and if taking more of a certain nutrient can balance their physiology better. The question should be if you can benefit from more (or less) of it, not if you’re getting the RDA. For the past 5 years, I was afraid to take vitamin A because a study was done with beta-carotene supplements that showed it increased lung cancer risk. I also read reports that showed vitamin A deficiency in the population was rare. I didn’t have the experience or the necessary knowledge to understand that deficiency and inadequacy are different. I still don’t think deficiency is a problem as much as some environmental factors – perhaps lack of sunlight or circadian dysregulation – is not allowing us to utilize it fully. If we got the sun, wore red Glasses at night and took care of our circadian rhythm, it should fix this part. I still recommend you consume foods like Cod liver, regular liver or supplement with Vitamin A/Retinol. I recommend first experimenting with a higher dosage and seeing how you feel – say 3,000iu. Then cut back to taking 2000iu daily. If you buy 8000iu, you can take it once every four days. Make sure to take extra K2 and D3. Vitamin A is especially important if you’re Th1 dominant and have low PPARy. Experiment and see if you notice a difference. Vegan or vegetarian diets can result in not getting enough vitamin A.
Chris Masterjohn followed a vegan diet and found his health went south. He was very thin and had chronic inflammation – indicative of low PPARs and Th1 dominance. He realized that he was deficient in real vitamin A and felt better by eating liver, the richest source of retinol. He was so enamored with vitamin A that he studied this subject for his Ph.D.
Vitamin A might be one of those nutrients that you can get enough of in a vegan diet if you’ve got the genetic predisposition for high conversion of beta-carotene to retinol or an anti-inflammatory/Th2 immune profile. However, it’s also possible that vegans are affected, but they don’t notice it. Well, these are signs that something about RXR or RAR isn’t working, and vitamin A deficiency is one possible cause. Negative effects of the sun? It’s important to know if you’ve got genes that cause reduced conversion of beta-carotene, because if you do then you definitely need to supplement if you’re on a vegan diet. The BCMO1 gene (rs12934922 and rs7501331) is known to influence the conversion of beta-carotene to vitamin A [R]. In test tubes, when cells have one T in both genes, they have a reduced conversion activity of beta-carotene by 57%. Females carrying the T variant of rs7501331 had a 32% lower ability to convert Beta-carotene. 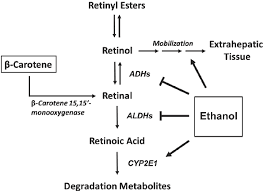 Those carrying at least one T in two genes (rs12934922 and rs7501331) show a 69% lower ability to convert Beta-carotene into retinyl esters. For rs7501331, 56% of the population has CC, 39% has CT and 5% has TT. If you’ve got CT or TT, you should make sure to get real vitamin A (especially TT). rs12934922 also converts beta-carotene to retinol. T is the ‘bad’ allele. 38% of the population has AA, 40% has AT, and 22% has TT (R). If you’ve got one T in rs7501331 then you should try to get some real vitamin A. If you’ve TT in rs7501331 then you really need to get real vitamin A. If you’ve got a T in both genes, then you also need to really get real vitamin A. If you’ve got one T in rs12934922, I wouldn’t worry. If you’ve got TT in rs12934922 then you should get real vitamin A, but it’s not as significant as rs7501331. I bought a Vitamin A Retinol supplement. 100,000IU. My eyesight was gettng worse quite quickly. I have been diagnosed with vitamin deficiency. My B Vitamins and D, Iron, Magnesium. I was told that liquid forms were better. I am planning on taking cod liver oil and castor oil. I feel lost when it comes to getting my health back. Maybe you can help? Do you know that all the companies that used to sell vitamin a from fish oil only are now doing a mix or going to all synthetic? I ordered a Carlson brand that said it was all from fish oil but the bottle came, it was a mix and without saying how much of each. just started cod liver oil (it took 5 brands to find the right one) and noticed my body suddenly graving magnesium citrate & Lugol’s iodine, can you explain y? What should I do…eye health is deteriorating and I have trouble converting? I was taking beta carotene and high Vitamin A and eye felt better but body didn’t like it increased estrogen I think. Any suggestions helpful. A few years ago I tried taking cod liver pills for acne. I ended up developing hundreds of pimples on the back of my head, and I couldnt even sleep right because of it. It scared the crap out of me. I stopped dosing immediately and was very discouraged. I dont have bad skin anymore like I used to, but I eat liver every couple weeks so I never have to see the dentist and Ive always figured the vit A helps with the skin. I wonder if it was because part of the supplement was synthetic, or did I simply take too much and deplete my zinc levels too much? This stuff is confusing. I would eat liver way more if it could help with stress and this tiny patch of eczema I get in the winter. But I am afraid. I wonder if taking zinc along with it could protect me. Thank you for this article. I have been researching vitamin A since 1987. They lie about how toxic it is. Just do some vitamin D if you do not get sun. Vitamin A use to be used as an antibiotic. I use it for Bacterial infections It is amazing, but you only do it for six days at a time ( of high doses), and go off. If you don’t know about the mineral, and vitamin wheels, research the antagonists and synergy. Vitamin A over a long period of time will start to throw out Copper, Calcium etc… Two biggest deficiencies in my opinion are vitamin A, and Potassium. I know what to take if antibiotics get anymore resistant. Vitamin A works best with the B complex vitamins, and vitamin E. Never do beta carotene supplements, they rob enzymes from the system. Those that think beta carotene is better through vegetables, I hope your stomach is perfect. I think and believe you need both. High doses only for serious problems. Niacin is an antidote to the methylfolate OD. I have one T in rs7501331 and I know something is going on because I have been experiencing serious dry eye problems. What is “Real” Vitamin A – what should I look for? Here’s the SNP page on SelfDecode: https://www.selfdecode.com/snp/rs7501331/. Animal-sourced vitamin A like butter, eggs, liver, cod liver oil. I have a T in both. I have found that when I take beta carotene on a regular basis, my palms and the bottoms of my feet turn orange. My body really does not seem to do anything but store it away in my skin. I have started supplementing Vitamin A for the last few years and with no ill effects. I also take D and K.
I had read retinol even in small amounts can disrupt vitamin D.
Hi Joe. Do you heard if somebody has used Retinol (not beta-caretone) and had very bad reactions? I ask this because I had very very bad reactions to methyl folate, tons of people also had this bad reaction and this lasts weeks. So I’m afraid to use a vitamin already converted (retinol). I tested quite deficient in retinol in spectracell. My pregnenolone is also non existent. It turns out that I am ++ in two bcmo genes. In my mind this adds up that retinol deficiency is my primary reason for recent blurred vision as well as adrenal issues and brain issues. Would you agree? Hey there, just curious why you say being homozygous T for s7501331 is worse than being heterozygous. I see no research stating having two T alleles is worse than one. Do you take Vitamin D since you are eating liver for your vitamin A, or do you think you get enough through food (grass fed meat and dairy, etc). I really messed up my family by giving them 5000 IUs of Vitamin D for many years with no Vitamin A and now we are playing catch up with the A (and the low ferritin). My husband would like us to get rid of all supplements now unless we really can’t get what we need from food. Thank you! I get enough sun, so I don’t need vitamin D.
I haven’t presented the evidence in this post, but there are bad converters of beta carotene to retinal, which you can check with 23andme. You may then be a bad converter of retinal to retinol. Perhaps the article was misleading a bit. I wrote about the importance of retinol, but I don’t have strong evidence that if you just consume beta carotene, you will have problems. However, many studies test supplementing with actual vitamin (retinol) and not beta carotene. The point is you should have a mix of the two, but I haven’t made a strong case for that in this post. Fair critique. I will revisit this topic in the future and address this. Hi, just want to say that it wasn’t actually the vitamin A giving me those symptoms I mentioned earlier. Those symptoms were produced by other dietary factors. I’m now taking 2500 IU retinyl palmitate, daily, without issue. Great article Joe, keep it up! I said 8000iu every other day, which is 4000iu daily. After more research I cut back my recommendations to 2000iu daily and this is what I’ve been telling clients for a bit and what I’d take for myself if I wasn’t still eating liver. I forgot to change the article, but I’ll do it now. It’s believed that the osteoporosis is as a result of not enough vitamin D because vitamin A competes. Joe do take D supplement to balance A?. And if so how much D and A will balance , lot of ppl are against D supplement as it consider harmone not a supplement .Having Hashimoto it is confusing if one take A and it can imbalance D now I learn it also effect K.
You need to balance them. 2000iu D per 1000iu A per 1mg K2…Is what I’d do..
Joe I thought it’s the other way around more A and less D … I.e. 2000 A and 1000 D for the balancing A and D?. why would vitamine A deficiency cause bad reactions to the sun ? I think I’m th2 dominant but perhaps low in vitamin A. I’m thinking about experimenting with a mega dose. How do you feel about getting vitamin A from cod liver oil? f.lux is NOT a substitute for red glasses at all. It didn’t work for me and I haven’t seen any evidence that it blocks blue and green light. If you have such evidence please provide it. You can test the red glasses by putting them by a blue light and you see none comes through.